Fundraising comes in all shapes and sizes, but there’s no doubt it’s a long, long way from a 1988 conversation around a South Carolina dinner table to almost $50 million in 30 years raised for children’s hospitals across America. 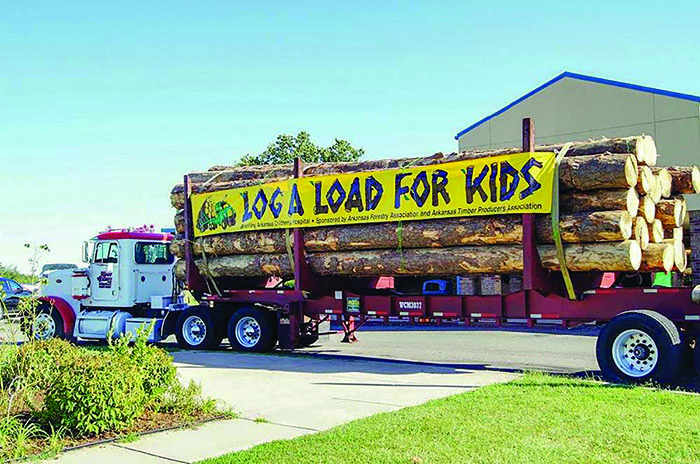 The ultra-successful Log A Load for Kids program, celebrating its 30th anniversary in 2018, now has active programs in more than 30 states and has raised more than $48 million for 70+ member hospitals during the past 30 years. The actual idea is credited to South Carolina businessman Bill Boyce, who was a dedicated telethon volunteer with the Medical University of South Carolina (MUSC). Boyce, who was named a top 25 industry influencer in Southern Loggin’ Times 25th Anniversary issue, was a friend of Larry and Carol Connelly, owners of Walterboro Forest Products in Walterboro, SC. In 1988, Boyce approached the couple with the idea for loggers to donate the value of a load of logs to local children’s hospitals through the Children’s Miracle Network Hospitals Telethon. It would raise money for a great cause and also give the logging industry a positive image. The Connellys, of course, thought it was a great idea. Soon, along with local MUSC telethon coordinator Rainey Evans, the group was presenting the idea to the South Carolina Forestry Assn. (SCFA), which agreed and would help back the program. With only two months to organize, promote and secure pledges, the project, headed up by Boyce, raised $20,000 its first year. The following year, Boyce and Charles Wright of Stone Container co-chaired the program and doubled the funds raised. As word spread, the race was on for other states to join. One big push was when former SCFA staff member Paul Howe joined the American Pulpwood Assn. and told other state officials about Log A Load. (Remember, this was way before cell phones and e-mail.) The SCFA also provided critical early support for Log A Load that included promotional materials, banners and pledge cards, plus developing operating rules and procedures. Ten years later, by 1997, Log A Load for Kids had spread to 24 states and had raised $2 million in ’97 alone—a hundredfold increase in just a decade. The basic concept of Log A Load For Kids is for loggers and wood-supplying businesses to donate the value of a load of logs, or any amount, to a nearby Children’s Miracle Network Hospital to be used in treating ill and injured children. Of course, knowing the generosity of America’s loggers, if donating a load of logs is good, then donating the proceeds raised through sporting clay shoots, golf events, carnivals, association dinners and auctions is better, much better. Along the way, state logging and forestry associations—and their related suppliers and vendor associate members, who provide key support as well—also found ways to contribute. Indeed, Log A Load for Kids is a testament to the heart of this industry, and the beautiful thing is everyone from small crew contractors and their families to executives from some of the largest timber and equipment companies in the U.S. have pitched in and lent a hand in time and money. It’s an amazing grassroots fund-raising effort. John Lauck, President and CEO, Children’s Miracle Network Hospitals, says the Log A Load program is an inspiration and one of the group’s longest-running and dedicated support partners.